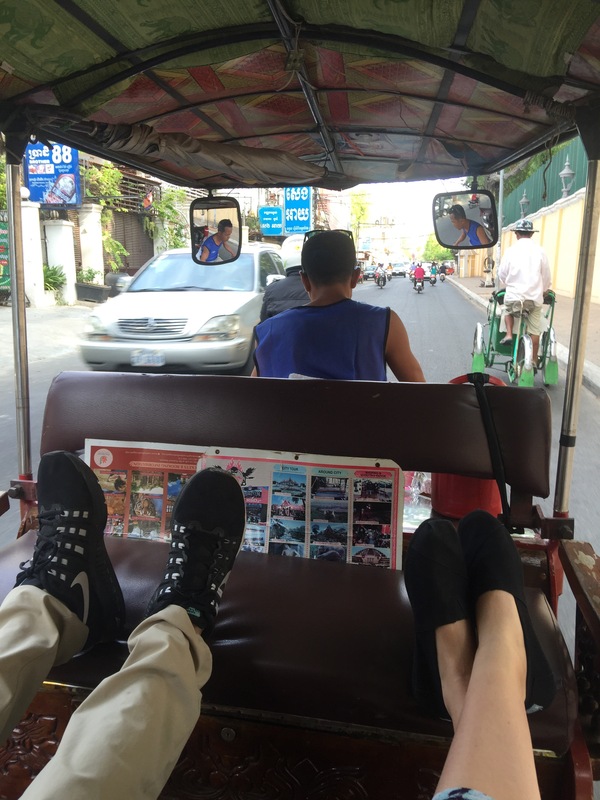 Tuk Tuk for the day $30,Visiting ALL of the Sites in 16 Hours $50, Lunch and Dinner $10, New City and Great New Friends…PRICELESS! 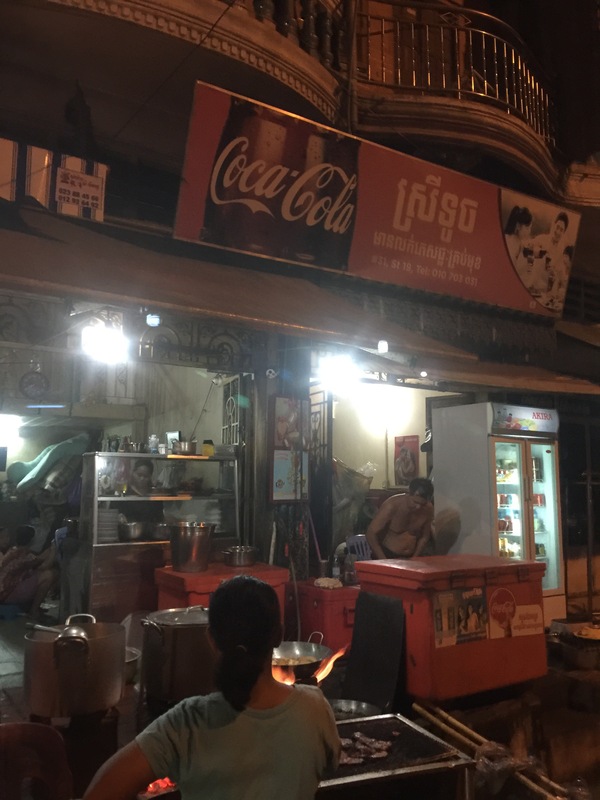 Our one full day in Phnom Penh started out with an early wakeup around 6:30am. We walked out of the Kabiki hotel and were able to find a Tuk Tuk driver waiting right outside on the street. 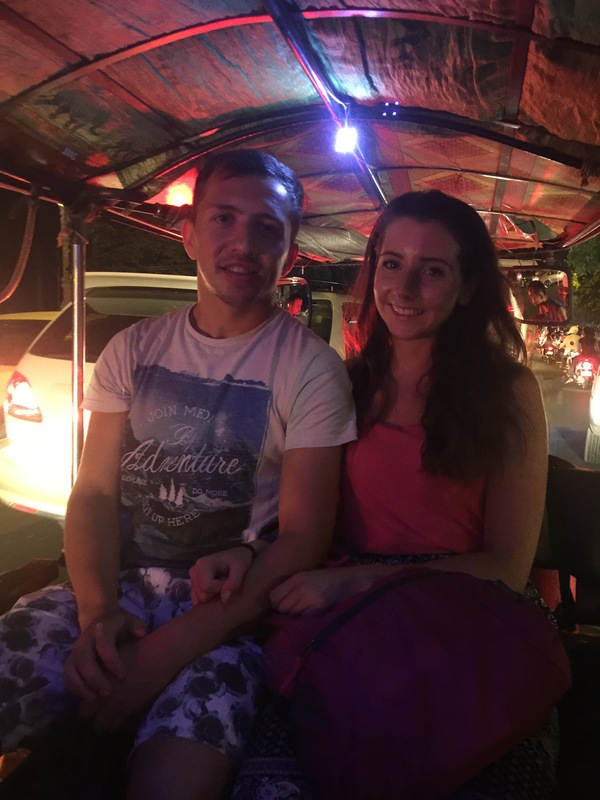 We were planning to spend the day with our new friends Gillian and Gavin from Scotland and decided it would be cheaper for the four of us to hire a Tuk Tuk for the day than pay for individual rides to all of our destinations throughout the day. So, a guy drove up to us in a royal blue t-shirt and asked if we needed a Tuk Tuk. We said yes and he told us it would be $30 for the day. We asked if he would do it for $20 and he said no, but $25 would be ok and we agreed. Sony was our driver for the day and he was awesome!! 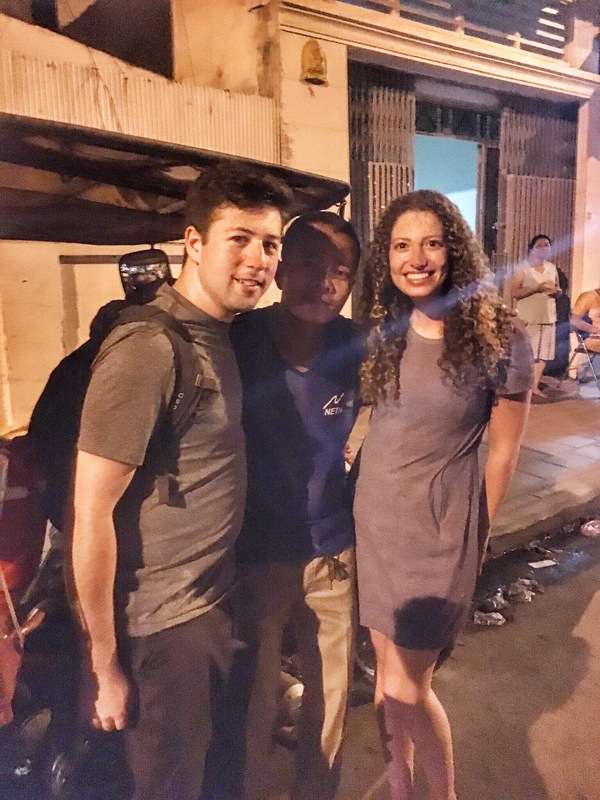 We have his contact information at the end of this article for anyone traveling to Phnom Penh. You can contact him directly and he will be happy to show you around the city and take you anywhere you want to go. First, we picked up our new friends at the guesthouse they were staying in. Our first stop was the Choeun Ek Killing Field, about a 30 minute Tuk Tuk ride from the center of the city. The entrance fee is $6 per person and they offer an audio tour included in admission. We followed the audio tour and spent about one hour at the fields. After this we made our way back to the city, another 30 minute Tuk Tuk ride, to see the S-21 jail where the prisoners were held before being taken to the fields to be murdered. Make sure you bring your student ID traveling with you because entrance here is $6 per person, but free for anyone with a student ID! We spent about 30 minutes here, but there is also an audio tour that will take about 1 hour if you chose to follow it. Next, we hopped back in our Tuk Tuk and took a 10 minute ride to the National Museum. Entrance here was $5 per person. You can sign up to watch a performance of traditional Cambodian dancing and sometimes you can even learn the dance and perform it as well. We skipped this, since today was the only day we had in Phnom Penh and wanted to see as much as we could. It took us about 20 minutes to walk around the museum. I’m sure that it is possible to spend a lot more time here, but it depends on your interests. 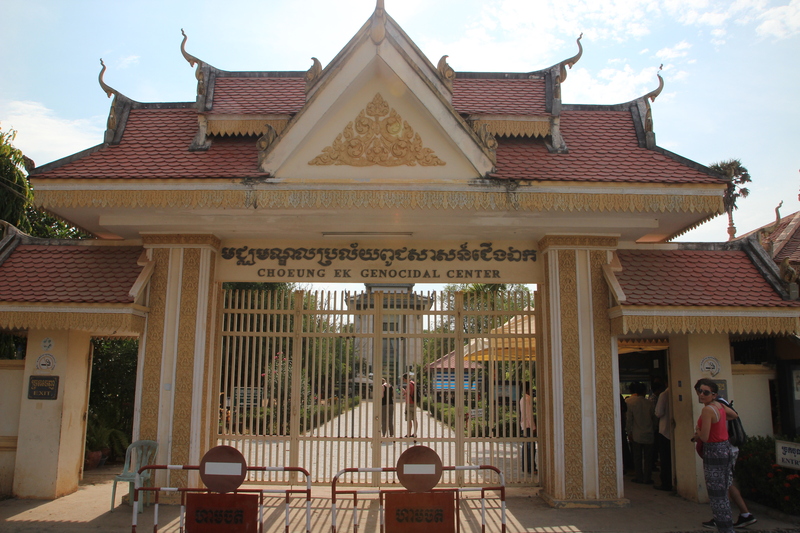 The museum is filled with sculptures, china, jewelry, scriptures and various other tools and decorations that have been used throughout Cambodia’s history. It reminded us a lot of The Met in NYC, but on a significantly smaller scale. The center of the museum is a courtyard with beautiful flower trees and small ponds with lilies and fish. You can purchase fish food and feed the fish, if that’s something you’re in to. When we finished up, we stopped for lunch. 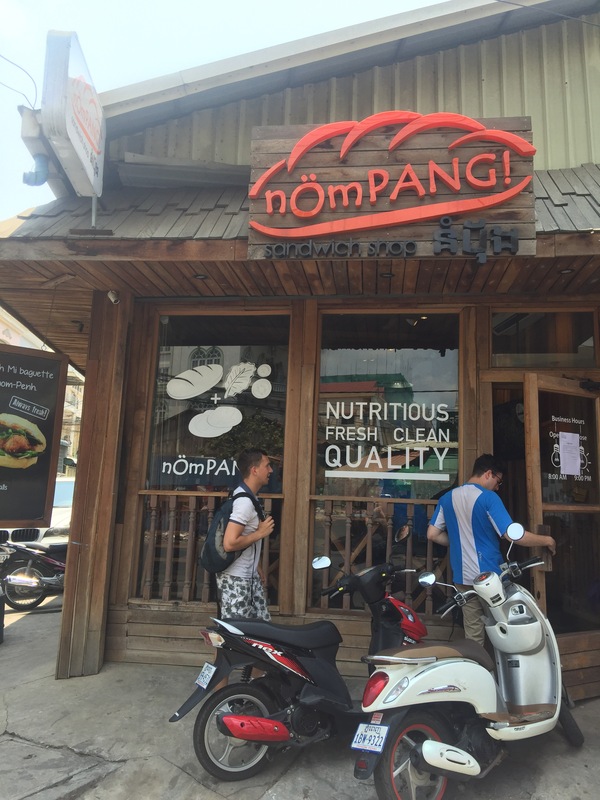 We went to a place called nOmPANG!. It was really good and you can read about our lunch experience in our article about nOmPANG!. Next, went over to the Russian Market, about another 10 minute Tuk Tuk drive. These short drives were amazing because it was so brutally hot that the fresh breeze from the open Tuk Tuk really cooled us down. We thought that going to the market during the middle of the day might have been a better choice and then heading to the two other destinations after, to avoid being out in the beating sun at peak time. However, we are still unsure if that was the right choice. Although the market is covered, it is still unbearably hot because there is no air circulation at all. The market is filled from floor to ceiling with clothing and shoes being sold in small stalls next to one another. Gillian and I bout some Fike (fake nike) clothing, she bought a Dri-Fit T-Shirt for $4 and I bought a pair of Dri-Fit leggings for $4. The quality of the nike goods seemed pretty spot on. They had some Fulu Lemon pants too ($5), but the quality did not seem to compare to the real ones. After about 15 minutes of wondering through the stalls, we bailed. When we walked back out to the street we stopped by a food cart that seemed to be making some sort of crepe with a white filling and something orange inside. We asked the man cooking what it was and he gave us a sample of the orange stuff and said “coco.” We realized it was coconut flakes that he was putting inside of these crepes along with a marshmallow spread. 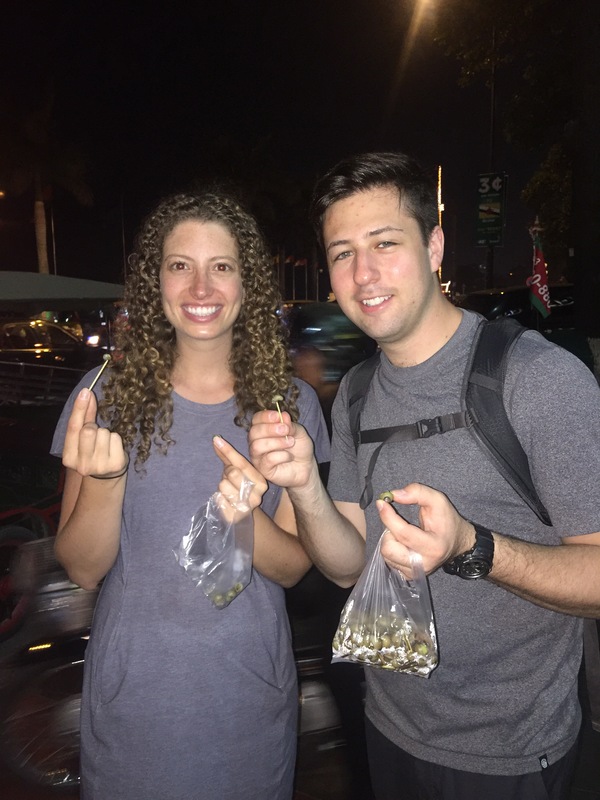 We asked how much for a bag (ALWAYS ask how much first) and he said $6000 riu ($1.50). The bag was filled with about 8 rolls of crepes, which were super crunchy and made for a great sweet snack for a bit of energy. Next, we were off to Watt Phnom, which charges a $2 entrance fee. The temple was very beautiful, but be warned that you have a decent amount of stairs to climb to get to the top as this is the tallest point in Phnom Penh. We spent about 25 minutes here walking around on the paths and enjoying the view. Our last and final tourist destination for the day was the Royal Palace and Silver PagOOOOda (*in the voice of our tour guide*). Very important: they will not grant you admission if your shoulders are not covered or if you are wearing shorts that do not cover your knees. They sell t-shirts there for $5 if you forget, but it might be better to just dress appropriately and respectfully. The admission fee was $6.50 and we hired a tour guide for a 35 minute tour for $10 total (split among 4 people, it just made sense). The grounds were breathtaking and you felt that you were transported out of the city to another place. We knew that the king was currently in his palace, since the flag was being flown on the flagstaff. The first building we saw was the Kings meeting room. Inside housed two throwns: One of which the king only sits on once in his life during the coronation ceremony. The other he uses during the rest of his reign for other events and meetings. The next buildings we went to were where the crown jeweler is held. It is actually kept upstairs and you are not allowed to view it but they do show you the Royal outfits that the king and queen wear during ceremonies. Being that the king is a bachelor he doesn’t wear this outfit. Additionally we saw the various uniforms worn by the servants and guards. Each person had seven different colored uniforms, one for each day of the week. This was so that the king would always know what day it was by the color that the personnel working for him would wear. Next we made our way over to the silver pagoooooooda. The building was floored with solid silver tiles, hence the name. We were unable to take photographs inside. On display were many gifts from other countries made out of bronze, silver, and gold and decorated with precious jewels. Our final stop was inside an air conditioned room that formerly house the two albino elephants of the palace. 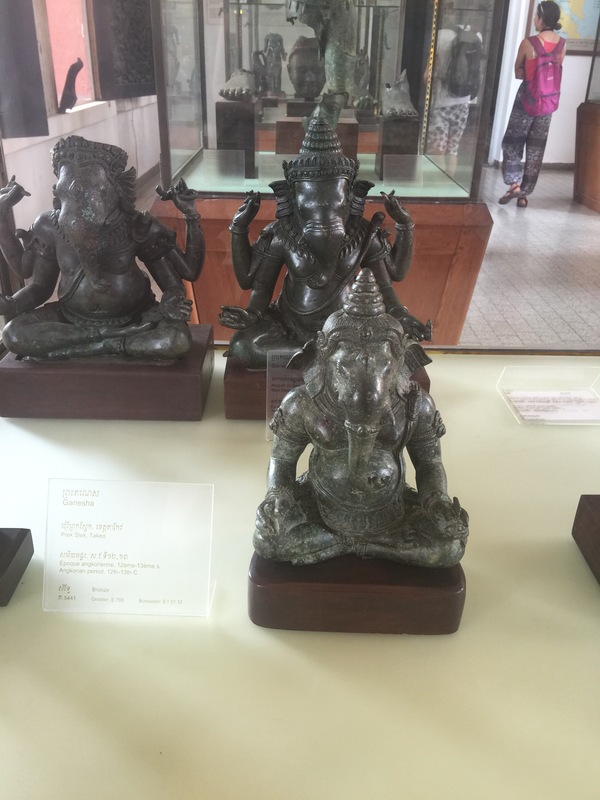 These elephants were used during processions and special occasions. Unfortunately, during the reign of Pol Pot, these elephants were killed. The albino elephants are endangered and they no longer attempt to keep any of them at the palace. Overall, the tour was very informative. We definitely recommend hiring one of the guides at the front of the palace where you buy tickets. The guide enhanced our experience and did not make the visit too long. Once the tour ended, we concluded that we had been going pretty hard the whole day and saw every single main attraction in the city by the time 4pm rolled around. So, the four of us went back to the Kabiki and took a quick dip in the pool. This was an amazing amenity to have. We highly recommend staying at the Kabiki and you can read about our stay in the article we have written. After a two hour break, we met Sony to finish up our evening. He took us to the riverside to walk around and grab a drink for happy hour. Steven and I got a bag of snails to snack on during our walk. They were sooooooo good! They were tiny snails that you grabbed out of the shell with a toothpick and popped into your mouth. We then had drinks at the rooftop bar called Star Bar. It seemed like it was the tallest rooftop on the water and we had quite the view. We were there for happy hour and it was buy one get one free cocktails and angkor draft beer. The cocktails are $4 and the beers are $2, so essentially we paid $2 a cocktail and $1 a beer. We stayed for two rounds of drinks and then headed down to meet Sony for our last stop, dinner. Thanks to the owner of nOmPang for the recommendation for dinner. We are still unsure of the name of the place, but it is near 217 Preah Ang Yukanthor Street (19), Phnom Penh. They serve BBQ pork over rice with a pork based soup and some pickled vegetables. We enjoyed dinner with Sony and some beer and cheersed to a successful and fun packed day in Phnom Penh. We truly were able to conquer the whole city in about 14 hours with our amazing new friends. Sony was awesome and held through until the end. Around 5pm we were not sure if he was still up to make it through the rest of the day with us, but he insisted on finishing the day. We decided to give him $30 rather than the $25 that we had originally discussed with him along with treating him to dinner and a beer. He was a pleasure, spoke english pretty well, and made sure we were always happy and having fun. We definitely recommend trying to spend the day with Sony if you are ever visiting Phnom Penh. 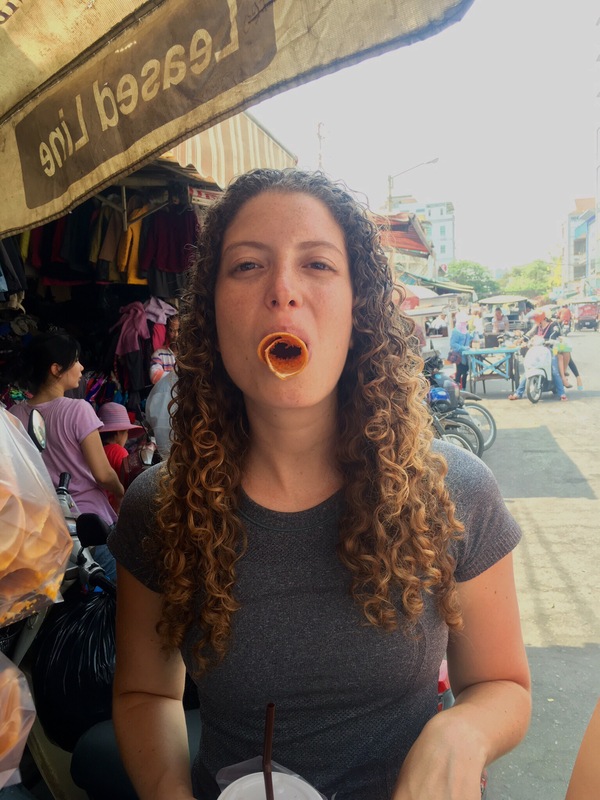 We are off to Siem Reap next and will be celebrating Jessica’s 26th birthday there!